In this guide, we will look at five of the best tire pressure gauge tools on the market right now. We’ll evaluate the pros and the cons of each model and then give you bits of information that you will need to select the right one that suits your personal needs and requirements. 1. How to Check Tire Pressure without a Gauge? 2. How to Use a Tire Pressure Gauge? 3. How to Check Fuel Pressure without a Gauge? 4. What is Your Tire Pressure Supposed to Be At? 5. What Tool Measures Air Pressure? We’ll kick off our list with this product from Vondior. As it is fitting for a product described as heavy duty, it certainly has a tough looking exterior! It also boasts a very good price point, being one of the cheaper items on our list today. 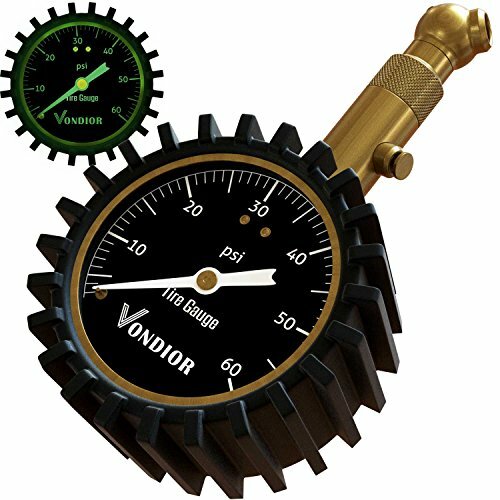 The Vondior Heavy Duty Tire Pressure Gauge is an analog-type tire pressure reader that can measure air pressure in the range of 0 to 60 PSI. Also, the product is certified as accurate to an error range of just 1% by the ANSI (American National Standards Institute). It boasts a very tough brass construction with an easy-to-read face or display that also glows in the dark. It measures around five inches in length and weighs just about 0.75 ounces. When it comes to pressure gauges, there can be quite a bit of difference in the complexity of the designs from one product to another. When it comes to simpler devices like this one, we want to see that the simple design follows over into a simple-to-use product. Therefore, we were very impressed with how user-friendly this device is. To use it, you push the small button mounted on the tube to reset the device. Then, you must push it against the tire valve, and after which, you’ll receive an instant reading. The dial itself is very easy to read, with simple markings and a nice thick needle to point out the pressure. The brass construction feels tough, and the whole unit feels well-built and solid. Having a straightforward design, the main drawback is the fact that a few features that you would expect to see on higher value items are missing. For example, the air tube is quite short, which means you are going to have to get right down to near enough ground level to take a reading. There are also no adapters for the air tube, so while it can connect to the valves found on cars and trucks, it won’t work on cycle and motorbike tires. Are you getting a sense of Déjà vu when you look at the product or is it just us? Our next product, which comes from Jaco Elite is very similar to the one we looked at above. It even has a near identical price tag! The highlights are, unsurprisingly, very similar to the item above! So, what we have here is a very simple analog style of tire pressure gauge, again with a fixed air tube connector and a brass construction. It is also certified as accurate to an error range of plus or minus 3% by the ANSI as well as has a measurement range of 0 to 60 PSI. What we liked about this product is pretty similar to what we liked about the previous one. It has a wonderfully simple design that makes it both very easy to use and read. The dial face is again designed to glow in the dark, which is a very useful feature. However, this model is slightly less accurate than the one above. On an analog model, that accuracy discrepancy will make very little, if any difference. This model also boasts brass construction and feels nice and robust. If the stuff we liked is unchanged, the stuff we didn’t like about this design is also broadly similar. Again, the solid air tube connector means you will need to get all the way down to ground level to connect and take a reading. This air tube is even shorter than the one of the previous models but only by a fraction. It can also require quite a bit of pressure to be applied to get a clean connection between the air tube and tire valve. That pressure requirement, when coupled with the rugged “cog” style design can leave the device cutting into your hands a little bit. For that reason, while it may be simple and effective, it’s not the most comfortable tool in the world. This product from Rhino is another of the simpler design of analog-type pressure gauges. Unlike the models we have seen so far though, it is also packing a number of useful features and premium design choices. 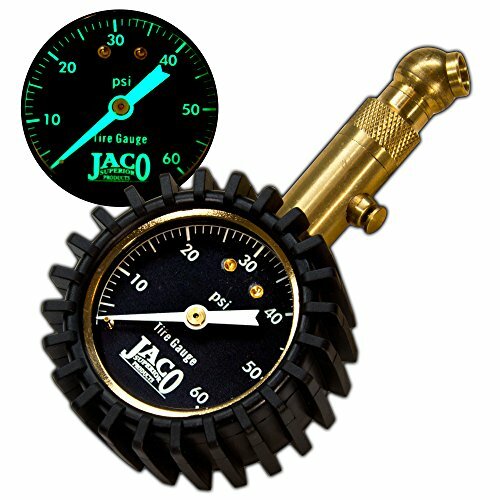 This is an analog style of a pressure gauge, but it has a higher measuring range than the previous models, being rated to measure from 0 to 75 PSI. It is again certified for accuracy by the ANSI. Additionally, it has a simple-to-read dial that glows in the dark. It also has a woven air tube of approximately eight inches long. The whole tool weighs a little over eight ounces. As another simpler style of a gauge, we were once again happy to see that the dial is nice and easy to read. The face markings and the needle glow in the dark on this model, which as we’ve mentioned already is a useful feature. The big stand out has to be that air hose. It’s of a sturdy, braided construction to prevent air leaks, but more importantly, it greatly increases the range of the gauge and makes it easier to use. Meaning, you don’t have to get down to floor level to connect it to a tire, and you can use both hands with this tool. The accuracy again is outstanding, as certified by the ANSI. Brass is used for the construction of the tool, making it feel solid. We were also blown away by Rhino’s customer service. They offer a money-back guarantee if you are not satisfied with the product alongside a lifetime warranty. There are no big issues with this model mainly because it does everything it says it will. Two small issues are the fact that once again, there are no adaptors for different valve types, and the air hose could have been a little longer to make it even more practical and easy to use. The next product to make our list is very much the premium tool on the list. It has a price well above all the others; in fact, you could buy the other four products for the price of this one. Nevertheless, it is packing a lot of very useful features into an extremely well-designed pressure gauge. Is it the best of the bunch and is it worth that price tag? This is an analog gauge that includes a 17-inch air tube made of military grade rubber. The display measures 2.5 inches, and the gauge is filled with liquid that helps, ironically, to protect it from moisture damage, helping to prolong the lifespan of the gauge. It weighs 1.2 pounds, measures pressure within a range of 0 to 60 PSI and is certified as accurate by the ANSI. It also comes with two metal tire chucks. There is a lot to like about this pressure gauge mainly because it is a premium model and therefore packed full of features. Let’s start with the construction materials. So far, we’ve mainly seen brass used across the models we looked at, while this product has metal attachments, not of brass but of strong and solid steel. Also, as we mentioned above, a tube connecting the dial to the tire valve does make the tool easier to use. Given that, we were very happy to see a long and sturdy rubber tube used here. Not only that, it’s also extremely flexible, making this pressure gauge the easiest to use of the bunch we have. Also, finally, we have a gauge with adaptors to use on a range of different tire valves! Similar to the device above, there are no glaring issues with this item primarily because it does everything it says it will. Unlike the items above though, it is going to take the big bucks to get this device. That in itself is probably its biggest downfall. The fact that while it is clearly an exceptionally well designed and built pressure gauge, it is also very expensive. We finish up our list with this model from DIYCO. Boasting an LCD screen for digital readouts and a multi-functional design, it is the most high-tech item to make our list. But is that enough to make it the best tire pressure gauge? While the gauge may have the same cog style of design, that is where the similarities end with the rest of the products on our list. The main big change is that this is a digital style of a pressure gauge. It also comes with a 3-in-1 adaptor for a wide variety of valve types. What’s more is that it can be connected to an air compressor, making this a multi-purpose tool. Additionally, it can measure a pressure range of between 0 and 150 PSI. This is a very different tool from what we have seen already for two distinct reasons. Firstly, this is a high-quality digital tool, and when it comes to digital devices, the most important feature is the screen. We were really happy to see that the screen is big, bright, and easy to read. It is also backlit, so like the glow-in-the-dark gauges we saw above, makes it easy to read in low-light situations. The other thing we liked about this tool is the fact that it not only measures tire pressure, but it can also adjust it. 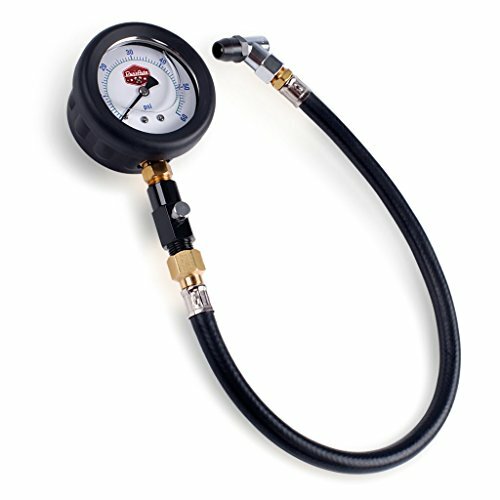 The gauge can be hooked up to an air compressor, and the gauge has built-in controls that can be used to add or remove air while also measuring it. That is a really useful, 2-in-1 design that could save you a lot of time. There are two issues with this device though. First off, it requires a compressor to be able to use its features. If you have one, great since it’s a really useful tool. If not, you either have to buy one or miss out on using some of the features that are built into this tool. The other issue relates to accuracy. The manufacturer claims it has an accuracy of within 1%, which is great. The problem is that unlike the tools we looked at above, this device is not certified by the ANSI, so we have no idea how accurate this claim is. That completes our in-depth review of five of the most popular tire pressure gauge tools on the market today. But with such variety in design, it can be hard to pick the right model for you. In this next section, we’ll go through some of the most important features and design points that you should consider when choosing your new gauge. After that, we’ll answer some of the most frequently asked questions about these very useful tools and then you should be equipped with all the information you need to select the right one for you. All the devices we looked at above measure within a range of 0 to at most 60 PSI. Some even go a little higher, but it is very unlikely you’ll need that extra capacity. As we’ll discuss below, most car tires have a pressure of around 30 PSI, so all the devices on this list provide plenty of capacity in terms of measuring range. You will typically only find battery power on digital models of pressure gauges. They also don’t use much battery power, so don’t worry about having to change them too much. Therefore, if you want a digital gauge, then don’t be put off by the battery power element, as that battery will probably last for years. With the high pressures that gauges need to handle, they do need to be made of high-quality, tough materials. Take note that there are some pressure gauges on the market with plastic connectors. You will have noticed that none of them made our list! All the gauges we chose included brass or steel as connectors and gauge body construction, so you can rely on any of the five above being built of the kind of materials that you can rely on. One of the big appeals of pressure gauges is that they are, or can be, very simple devices that remain effective even without a lot of features. The most straightforward device simply plugs into a tire valve and gives a reading. On the other hand, more premium models will have different adapters so that they can work on different types of tires. They will be built of premium materials too for an extra long-lasting use. You can also get multi-tool products like the last gauge to make our list above. 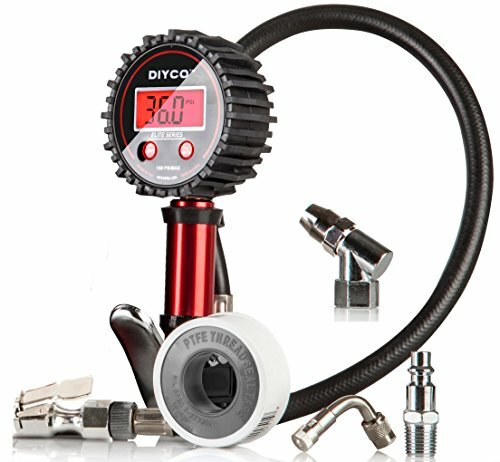 This not only measures but can also be used (in conjunction with a compressor) to inflate a tire. As with any product, of course, the more features you want, the higher the price tag is likely to rise. If you go digital, then you need to make sure the LCD screen is easy to read. The models we selected above match this criterion, as they have a bright LCD screen. If you don’t go digital, it’s still important that the gauge is relatively big. You don’t want it to be huge, as that will make it harder to hold and use. The devices that we looked at above have a gauge diameter of around two to 2.5 inches. That, to us, represents a good middle ground of being easy to handle and easy to read. You take a picture of the tire and the app will compare it with similar tire brands on similar vehicles. It is, of course, nowhere near as accurate as a proper gauge, but as an emergency solution, it is ok. It is very hard to measure fuel pressure without a gauge. They aren’t very expensive, so if you do want to measure the fuel pressure, it is recommended that you pick up a gauge or take the car to a pro mechanic. The typical car tire will have a pressure of between 30 and 35 PSI. This can sometimes be a little lower for tires on SUVs, which sometimes have a PSI as low as 27. The best advice we can give you is for you to look at the owner’s manual of your vehicle for recommended pressures or look up your tire online at the manufacturer’s website where you will easily find recommended PSI levels. The tool that measures air pressure is called a barometer. To be honest, it was very challenging to pick the best tire pressure gauge from our list because each tool was of very high quality. We were leaning toward Dans Auto Professional Grade Tire Pressure Gauge as the top pick simply because it was packing so many features. However, as we mentioned in the review of this product, it is carrying a premium price tag to go along with that premium feature list. 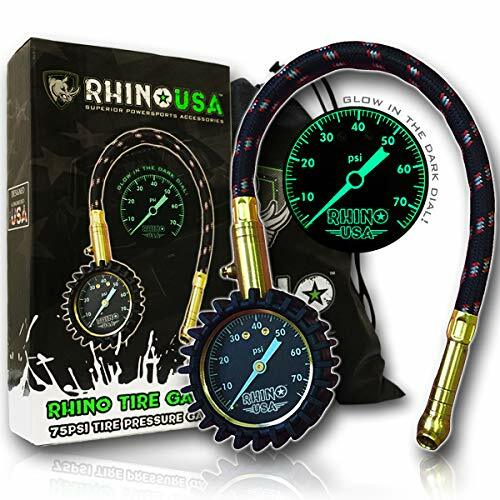 For that reason, we’ve gone with the Rhino Heavy Duty Tire Pressure Gauge as the top pick. It has a combination of the well-built and an easy-to-read design of the first two products with the user-friendly, flexible air tube found on the last two. Overall, the Rhino Heavy Duty Tire Pressure Gauge is an accurate and straightforward tool that delivers a great job and available at a very reasonable price.